Yasir Arafat was elected chairman of the Palestine Liberation Organization (PLO) in 1969. Though originally in favor of an all-out war to end Israel's occupation of Arab lands in the Middle East, from 1974 on he and the PLO claimed to be interested in a peaceful resolution to the Palestinian problem. Yasir Arafat was born Abdel-Rahman Abdel-Raouf Arafat al-Qudwa al-Husseini on October 24, 1929, to a Palestinian family living in Cairo, Egypt. His father was a merchant. Arafat's youth was spent in Cairo and Jerusalem. At that time, in the decades following World War I (1914–18), the British ruled Palestine. Many Jewish people from Europe sought to build a Jewish homeland there, but many Muslim and Christian Arabs who lived in Palestine opposed Jewish immigration because they were afraid it would upset the cultural balance there. While still in his teens Arafat became involved with a group seeking independence for Palestinian Arabs. When the British moved out of Palestine in 1948 and the Jewish state of Israel was created on a piece of Palestinian land, fighting broke out between the Jewish and Arab communities. The Jews were easily able to beat the Palestinians. As a result approximately one million Palestinians were forced to flee their homeland and seek refuge in neighboring Arab nations. Thus two-thirds of pre-war Palestine then became Israel. The rest came under the control of two Arab neighbors, Egypt and Jordan. After the Palestinians' 1948 defeat, Arafat went to Cairo, where he studied engineering and founded a student union. By the end of the 1950s, he helped to found al-Fatah which became one of the main groups in the new Palestinian independence movement. Arafat was one of Fatah's most important founders and sat on the group's central committee. Fatah members argued that Palestinians should seek to regain their country by their own efforts, including guerrilla warfare (independent acts of war and terrorism) against Israel. This armed struggle was launched in 1965. The attacks did not damage the Jewish military, but they did increase Arafat's popularity. Meanwhile, in 1964, Palestinian freedom fighters in Arab countries had created their own confederation, which they called the Palestine Liberation Organization (PLO). Syria. The Arab states were embarrassed by this defeat. Fatah members were able to assume control of the PLO, with Arafat elected chairman of the executive committee. Guerrilla camps were set up in Jordan along the border with Israel. In September 1970 Jordan's King Hussein (1935–1999) sent his army into the camps, killing many Palestinians in what became known as Black September. The PLO began to engage in terrorist acts, including the murder of eleven Israeli athletes at the Olympic Games in Munich, Germany, in 1972. In 1973 Egypt and Syria attacked Israel in the Yom Kippur War, an attempt to regain lands Israel occupied six years earlier. This led to efforts by the United States to seek peace in the region. In 1974 the PLO voted to be included in any settlement. It also called for the creation of a Palestinian national authority in two areas the Israelis occupied in 1967, the West Bank and the Gaza Strip. Participating in a debate on the Middle East at the United Nations General Assembly, Arafat said, "I have come bearing an olive branch and a freedom fighter's gun. Do not let the olive branch fall from my hand." The Israelis and the Americans refused to have any dealings with the PLO until it recognized a United Nations resolution regarding Israel's right to exist. Arafat and the PLO would not satisfy this condition. 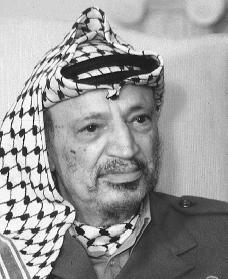 Arafat and the PLO also opposed peace agreements proposed by Egyptian president Anwar Sadat (1918–1981) in 1977–79. These agreements were known as the Camp David Accords, because they had been drawn up in Maryland at the U.S. presidential retreat of that name. Egypt, Israel, and the United States signed them in 1978. They called for the establishment of Palestinian self-government in the West Bank and Gaza, but the plan never went into effect. The PLO continued its demand for an independent Palestinian state in the area. Arafat worked to make peace with Jordan and Egypt throughout the 1980s, and sought help from the United States in setting up a confederation between Jordan and a Palestinian entity that would be established in the West Bank and Gaza. King Hussein broke off talks with Arafat, however, saying that the PLO refused to compromise. In 1993 Arafat and Israeli Prime Minister Yitzhak Rabin (1922–1995) signed the Oslo Accords. The following year the two men and Israeli foreign minister Shimon Peres shared the Nobel Peace Prize for their efforts. The Oslo Accords placed the city of Jericho, the Israeli-occupied Gaza Strip, and eventually the remainder of the West Bank under Palestinian self-rule. In January 1996 Arafat was elected president of the Palestinian National Authority (PNA), the area's new governing body. Later that same year an agreement was reached to remove Israelis from the last occupied city in the West Bank. In return Arafat promised to amend the portion of the Palestinian National Charter calling for the destruction of Israel. Israel's decision to build homes in Jerusalem started up the terrorism campaign once again in the Middle East, placing peace efforts on very shaky ground. In July 2000 peace talks between Arafat, U.S. president Bill Clinton (1946–), and Israeli Prime Minister Ehud Barak (1942–) at Camp David did not lead to any agreement. Arafat had said that he would declare a Palestinian state on September 13, 2000, with or without an agreement with Israel. He finally agreed to wait in the hopes that more talks might lead to a settlement. Unfortunately, outbreaks of violence began between Palestinians and Israeli security forces. In October 2000 Arafat, Barak, and Clinton met and came up with a "statement of intent" to end the violence, but neither side was completely satisfied. Nearly one hundred people, almost all of them Palestinians, had been killed in the clashes between Israeli security forces and Palestinians. In November 2000 Arafat told Fatah activists to cease firing on Israelis. Steady gunfire followed news of Arafat's announcement, however, with Palestinians shooting at Israeli positions from an apartment building. Israeli forces returned fire with machine guns. Though Arafat was offered a peace proposal designed by Clinton and approved by Barak in January 2001, the leader found it unsatisfactory (it did not allow displaced Palestinians the right to return to their home-land), and the Arab-Israeli violence in the Middle East continued. After the attacks on the United States on September 11, 2001, the U.S. government increased the pressure on the Israelis and the Palestinians to reach a settlement. The United States hoped to involve Arab nations in the fight against terrorism. Despite Arafat's demands for it to stop, there seemed to be no end to the violence, however. In December 2001 the Israeli government severed all ties to the PNA, leaving little hope of a resolution anytime soon. And on two occasions in 2002, the Israeli army took over the majority of Arafat's compound, essentially making him a prisoner in his own home. Aburish, Saïd K. Arafat: From Defender to Dictator. London: Bloomsbury, 1998. Wallach, Janet, and John Wallach. Arafat: In the Eyes of the Beholder. Rev. and updated ed. Secaucus, NJ: Carol Pub., 1997. Why is it not noted that the Jordanian Arabs and the Egyptians were not allowed to be called "Palestinians? the Arabs who lived in the land termed "Palestine", as it was a term given to the Jews to insult them concerning the arch enemies of the Jews the Philistines, were called Arab Palestinians, but totally rejected it. in 1967 I believe it was, Arafat decided it would benefit their cause of ousting the Jews. not many seem to realize this fact.at least all the leaders should know this history of a people called the Palestinians who were the Jews. it started out in 70 AD when Israel was taken over by the Romans and to try and wipe out the name of Israel called it Philistina which later became Palestina then as we now know it, Palestine. there never has been a state of Palestine owned by the Arabs. they did own some land there when the Jews were dispersed, but there has also been Jews there in the land all this time as well. this land is on in dispute because there are hose who want to destroy the Jews and take everything for themselves, they do not care about the land. the younger ones I am sure do believe that the land was stolen from them by the Jews as they are taught that from youth. Very sad, speak with Palestinians who were there went to bed as Jordanians and woke up Palestinian not knowing what happened or why. check out the true history of the land, you will discover the facts. jacqui, not all Jews were dispersed from the Levant in 70 AD. They were banned from Jerusalem, but not from the rest of the Levant and many if not most continued to live there, though there were some of course who emigrated. Of those who remained, many were either at the time followers of a little known guy named Jesus or later converted to Christianity when it became the official religion of Byzantium, the Eastern Roman Empire. After the Arab conquest, the Arabs maintained a garrison and administration, but did not heavily colonize the area. Thus, the inhabitants of the Levant circa 1850 were almost all descendents of the largely Jewish population of 70 AD. For business purposes, it was expedient for them to adopt the religion and language of their conquerors. The descendents of Jews who spoke Aramaic in 70 AD had largely converted first to Chrisitanity and Greek, then to Islam and Arabic. The result was a varied population of majority Muslim Arab with a minority of Christian Arabs and a few who continued to practice Judaism. Ben-Gurian and Ben-Zvi knew this to be true and co-authored a Yiddish book about it in 1917. There was also a more 2009 article about this in the Jerusalem Post, entitled "The lost Palestinian Jews."